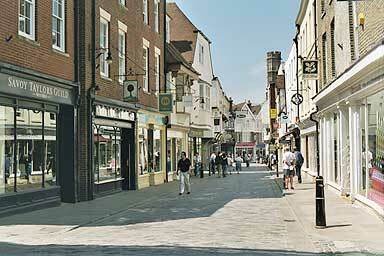 We are getting close to the Cathedral now, or rather the open space in front of the gate known as Buttermarket. Although the buildings on the left look old, they are not, they are part of the recent new development in the Longmarket area, designed to `fit in with their surroundings'. Rents are high in this development and only large shops can afford them. Turning left here takes you into the street called Longmarket and back onto Canterbury's main shopping street.